November 5, 2017, 2:56 PM · Jean Sibelius’ tone-poem, Finlandia, wasn’t supposed to be the program headliner last Saturday night at the San Francisco Symphony. The main draw was the Sibelius Violin Concerto, gracefully and sensitively rendered by Latvian violinist Baiba Skride, with Finnish guest conductor Osmö Vänskä leading the orchestra. Vänskä, music director of the Minnesota Orchestra—they of the Great Lockout of 2012-14 infamy—literally staked his position on turning said orchestra into one of the country’s finest, resigning in protest in the later months of the lockout, only to be rehired the following April (good call), where he now continues, with the Minnesota Orchestra, to excel and produce world-class music. Particularly impressive are Vänskä’s Sibelius interpretations. No surprise, perhaps, as both hail from Finland and both have captured, in the music, the nuance, proud spirit and dignity of this Nordic country. And no piece conjures a sense of Finnish national pride more so than Sibelius’ Finlandia, a patriotic tone-poem, the seventh of seven tableaux written in 1899 and revised a year later. Coming in at eight-ish minutes (can be up to nine), it’s short, but amazingly effective. The first part delivers a brooding fanfare of horns, rumbling timpani, depicting menace, oppression that, indeed, was part of Finland’s history, through occupations by Sweden and then Russia, into the early 20th century. The middle part of Finlandia calls in strings and woodwinds, a gentler but no less affecting sound, before the piece really ramps into high gear. It becomes propulsive and spirited, with plenty of crashing cymbals and an increase in speed and intensity from the entire orchestra. And then, at its peak, comes the melody, slow and majestic, instantly timeless and memorable. Strings, woodwinds, brass all play in tandem, contributing different textures that meld perfectly. When the horns sustain one of their notes against the melody, it’s so beautiful—one of the most vivid aural depiction of love, fealty and longing I’ve ever heard. It never fails to make my throat contract, my eyes sting. Saturday night at Davies Symphony Hall, Vänskä conducting, was no exception. This article first appeared, in modified form, at The Classical Girl. November 6, 2017 at 09:56 AM · Nice article, Terez. I do love me some Sibelius. November 6, 2017 at 02:22 PM · Thanks, Neil! And ditto on the Sibelius love. I'm having so much fun discovering some of his shorter, lesser known works. Had never heard of "Press Celebration Music suite" prior to researching this blog. The things you learn...! November 6, 2017 at 03:49 PM · For crying out loud, it's Vänskä! November 6, 2017 at 04:41 PM · Thank you for this post. As an native Finnish musician for me Finlandia-hymn, as it is called recently in Finland, is part of our history as a nation. It was first performed over 118 years ago in Helsinki, Finland (4.11. was the date). In that historical time Finland as an autonomous part of Russia was deeply concerned about censorchip against free publishing of newspapers for example. That censoring of the newspapers was an idea from russians who were leading Finland. This was the background of the historical situation in that time. I've read about Sibelius' thoughts about Finlandia. He wanted this particular compose to be not owned for one nation but for every human beeing if anybody wants to"own" this "song" . But the original idea of this work of art was coming from concerns for a tiny country from north to be in real danger pulled out from the chart of being a nation within nations. A concern about the survival of one's own identity what was just wakened for that small nation. I've also read that Sibelius said later that this melody as known as Finlandia was given for him "from heaven" and it was for him by his own words "pure inspiration". The name of Finlandia was proposed by one of Sibelius' greatest time-fellow fans Axel Carpelan. He asked for the leader of Helsinki city orhestra to tell Sibelius that Finlandia should be the name of the hymn. November 6, 2017 at 07:54 PM · Oh, I so enjoyed reading your comment above that elaborated on Sibelius' "story behind the story." I hope everyone takes the time to read it. How beautiful, that Sibelius wanted the composition to be owned not by one nation, but for all people. I know the short-lived country of Biafra, in West Africa, used it as their national anthem, back in the 1960's. It certainly does have a universal appeal. And it certainly does sound to me like music that came "from heaven." I don't think I've ever listened to it without getting chills. Thank you for your lovely contribution to the article discussion! November 7, 2017 at 03:46 AM · No, wait! Skride was phenomenal. November 7, 2017 at 04:25 PM · Oh, she was, she was! Really, I'd thought that was going to be what I wrote about. Joshua Kosman just raved about her performance, in the San Francisco Chronicle. But I had been such a champion of Leonidas Kavakos' Sibelius VC a year (or two?) earlier, which Kosman did not rave about, in the least, that I'd felt compelled to write about a different angle of this concert. Really, that whole first half of the night's performance was sublime. If anything, it made the Shostakovich Symphony No. 1 seem... dunno... uneventful, in comparison. ((And I'm sure there's someone out there who will ding me for saying THAT.)) Most of all, I was so pleasantly surprised by hearing Finlandia live, and what a difference it makes. But, yes, kudos to violinist Baiba Skride for her lovely performance of the VC. November 7, 2017 at 07:43 PM · I am a big fan of Sibelius. Thank you, Terez, for telling us so much about the composer and this piece in particular. This knowledge enriched my appreciation of the artistry of this piece. November 7, 2017 at 10:39 PM · Pauline, thank YOU for sharing your thoughts here. Always fun to hear who else is a Sibelius fan. Did you listen to the "Press Celebration Music" suite? It's a delightful discovery. And right now I'm infatuated with his Symphony No. 3 as well (oh, the gorgeous second movement!). Check it out if you haven't. November 8, 2017 at 02:00 AM · Some sixty years ago, during my schooldays, a new teacher at my (high-)school was welcomed by the Head of Music to play some of his record collection to us. When introducing Finlandia, he told us that the tune in the middle was a traditional Finnish hymn which Sibelius had adopted. Over the years, every time I have come into contact with Finlandia, I have been puzzled by never ever again hearing or reading anything about this - Thank you Terez and 88.113.242.121, not only for setting the record straight, but also for showing that there really was a record TO be set straight. The tune is used in English language churches for "We rest on Thee, our Shield and our Defender", for which it is the best tune (and when I'm playing in it, I love to play "Dum - da dadadada Dum Dum" quaver-rest "Da" on the word "battle", the "-tle" coming on the quaver-rest; I feel even better about doing that, now that I know that the tune is as original to Sibelius as "Dum - da dadadada Dum Dum" quaver-rest "Da" is) and, famously, was used by the five Ecuador Missionary Aviation Fellowship martyrs when they sung that hymn on the beach awaiting the "Auca" Indians (who killed them soon after arrival), but also, sometimes, for "Be still, my soul, for God is on thy side", for which I think the equally beautiful "Song 1", by Orlando Gibbons, is more suitable. 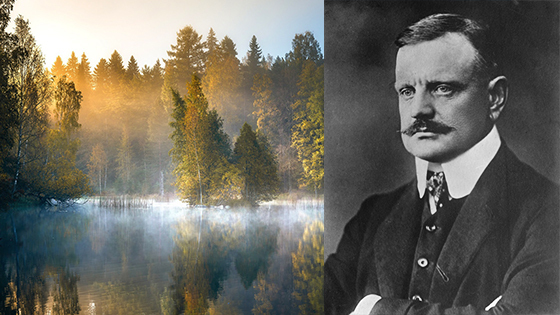 With sincere best wishes and gratitude for a wonderful Tribute-Article on Sibelius & the Centenery upcoming of Finland's 'Liberation' on December 6, 1917, on this December 6, 2017 Year. I will pass word around regrading this auspicious Finnish Anniversary which closely coincides w/ the One Hundredth Year Anniversary of the most Historic Musical Debut in Violin History, the Carnegie Hall Violin Recital Debut of Jascha Heifetz, on October 27, 1917, which was/is being celebrated during this Centenery Year of Heifetz's astounding Debut to a Sold Out NY audience with Music 'Royalty' in attendance including Mischa Elman and Fritz Kreisler plus a NY pianist, Leopold Godowsky, whom Mischa Elman sweating-ly turned to during a long Intermission, asking pianist, Godowsky, 'Isn't it hot in here, Leopold?' to which now World famous Godowsky replied, "Not for Pianists!!!" Please keep speaking and writing glowingly about Jean Sibelius!! *Best to John Rokos as well! Choking back tears, Thank You, Terez Mertes! Elisabeth Matesky ~ with my heart back in Finland! November 9, 2017 at 03:51 AM · Thank you, in return, Elisabeth, for your lovely musings. You shared so much - what a pleasure to read! John, I enjoyed reading about your experience, as well - yes, it was a bit of a myth that the folk tune (or traditional hymn) had come first and Sibelius had created Finlandia based on that. Nope! And I know there are at least half a dozen hymns or anthems that use the melody - I've yet to encounter one in church, but I'll bet one jumps out at me now. Sure to be strange! And Mattias, well, that was a thought-provoking (or not) link you posted. Ah, refreshing, the wide variety of replies my article is drawing. Thank you, one and all, for your replies! Am enjoying the extended discussion. November 9, 2017 at 03:54 AM · Elisabeth, I'm still chuckling over this. Have heard it before, but it's one of those charming anecdotes that never loses its freshness. > ... the Carnegie Hall Violin Recital Debut of Jascha Heifetz, on October 27, 1917, which was/is being celebrated during this Centenery Year of Heifetz's astounding Debut to a Sold Out NY audience with Music 'Royalty' in attendance including Mischa Elman and Fritz Kreisler plus a NY pianist, Leopold Godowsky, whom Mischa Elman sweating-ly turned to during a long Intermission, asking pianist, Godowsky, 'Isn't it hot in here, Leopold?' to which now World famous Godowsky replied, "Not for Pianists!!!" November 10, 2017 at 04:54 PM · LAURIE..so many thanks for your prudent inclusions on this site....after reading the paper, hearing of the world's woes, it is always a great escape to venture to Vlnist.com and absorb what is most interesting, musically vital and pleasurable. This Sibelius saga and related offerings by other readers is so reassuring that being-a-practicing-music performer/consumer is an esoteric but righteous and rewarding aspect of life. November 10, 2017 at 05:36 PM · Way, cool, Laurie - since the melody of the hymn is forever in my head, the words slipped right into place. What great words, too. Too bad the whole world isn't listening, huh? November 11, 2017 at 02:44 PM · One of my absolute favorites composed by Sibelius is the suite called Rakastava (The Lover). The first movement has a beautiful reoccuring theme, sounds like a desperate last cry for help. Second movement is a very mischievous one, sounds like a film theme where the protagonist goes on adventure. Third movement begins with a wonderful violin solo that is so hard to forget.